Fiberglass doors provide several advantages over traditional wood and metal doors. 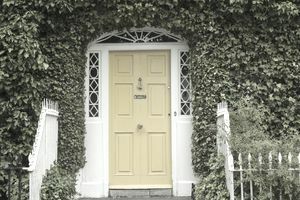 Fiberglass doors can be produced to look alike wood, and even a door expert cannot differentiate between them. Built tougher than regular doors, performing better under sudden climate changes and being able to be customized for your specific needs. Some manufacturer's even specified that their products contain no CFC'S, so you will get a product that will not harm the environment. Even a new technology called 'Accugrain,' introduced by Therma-Tru, duplicates the grain of real wood. Although Therma-Tru can be considered the pioneer of this method, many such as Jeld-Wen, Masonite and Plastpro have followed and used the same technique. Many builders are opting to use fiberglass french doors as entry doors but also on garages and many other areas around the house. However, keep in mind that these doors might crack if they are hit hard. Compared to Wood: Though fiberglass doors might present you with a higher up-front cost when compared with traditional wood and metal doors, in the long run, the benefits will surpass that initial investment. These doors will rarely be scratched, peel or warp, and can resist different weather conditions performing better and lasting longer than wood doors. Not only are they tougher and more durable than their vinyl compatriots, but they come in a wide array of colors and styles and can be customized to your size selection. Maintenance-wise, fiberglass is pretty low key, and is resistant to buckling and denting. Its wood-like surface can be painted easily, and since the interior is filled with insulating foam, it is five times more effectively insulating than wood doors. Compared to Steel: Steel is certainly durable, but is capable of being dented. Additionally, steel rusts quite easily, which may cause problems down the line. Though it may seem that painting over steel would pose as a solution, the paint will likely peel with time. Perhaps one of the biggest strikes against steel doors is how uninsulated it is. Hot or cold temperatures are known for making their way through steel doors, making them unreliable in fluctuating weather conditions. That being said, steel is much less expensive and still energy efficient and durable as compared to a wood door, though it doesn't hold up quite as well as its fiberglass counterpart. Steel also offers a good R- value and is crack resistant. Be aware that although fiberglass doors are commonly used in many houses, they can also be warped. This can be prevented by cleaning them regularly and protecting them from the sun and UV exposure. Look for doors that have been assembled using reinforced fiberglass panels, full-length stiles, and water-resistant seals. In addition to these costs, the material on which the door and frame will be installed can make the price swing up almost as much as the door cost itself. In general, fiberglass doors can be installed using the same cost as those billed for a wood door. For better pricing and more accuracy, it is recommended to produce a field installation estimate, as measurements and opening dimension needs to be precise and a complete assessment should be performed. You can always ask for assistance from the American Window and Door Institute. How Much Cost Will Hurricane-Resistant Windows Add?